An Elektron Monomachine “alone” song! The Monomachine is an interesting instruments not only for “classic” synth sounds but can even work as a 6 elements drum synth sequencer. The Six machines are not a great restriction for rhythmic composing, as the beatbox on one track only can keep the rhythm busy, while I can synthetize kicks snares, percussions and cymbals on the other channels/machines. In this post I want to examine the monomachine as a “kick generator”. The best “Kick machines” are without any doubt the GND-sin and the EFM machines. The best way to start is to genearate the SINE wave, with the envelope with the decay set to do a 808 type kick and hold and release at ZERO. The first thing to understand it’s that the punch in the sound is given by the typical pitch sweep. Faster is the sweep , harder is the punch. So to make the pitch sweep you can use the LFO , set to TRIG , with the EXP wave, getting the right amountand the right Speed. As you have created your kick sound , then applying the “dynamics” efx in neighbour mode (on the folloowing track ) and setting the compressor to work in a rude way with a high ratio, medium attack and short release you get the final punch to the kick. The Sequencer is one of the most interesting parts of the Monomachine as it can control anything on the machine. The sequencer works as a realtime or step (Roland TR-like) mode , and it can be switched record on or off with the sequencer running. That’s ideal for live performance! Programming notes is easy, if a midi keyboard is connected it can record from midi in , but it can be programmed standalone using the step sequencer buttons as they act as keys. After notes programming the most useful things is the PARAMETER LOCKS programming. A parameter lock is a motion sequence of a parameter. It can be done on a single step (using step programming) or it can be recorded realtime turnig the knobs while the sequencer is running in realtime recording. This function enables to modify extremely every nuance of the sound in a very easy way , and It’an effective strenght of the Elektron philosophy. Every thing in the machine can be controlled by the sequencer and the intensive use of parameter locks can create sound sequences really complex and even really difficult to recreate with another instrument. The Monomachine is what I call THE unortodox synth concept in an alluminium box. Everybody interested in innovative music machines knows the philosophy of the Elektrons, an easy and intuitive approach to manipulation/creation of sounds and sequencing, multi synthesis to have a extremely versatile palette of sound at your fingertips, a really good support from tutorials to fresh new O.S. often released to get more power from your machine. The Monomachhine is structured as six digital monosynth with efx, arpeggiator and a 64 step sequencer track. Every “monosynth” can be a synth , a efx processor or an audio in track (to process external signals). So this box can generate, process and manipulate audio material all together in a really easy way. You can build a kit with a different machine on every track , so you can have a very versatile sonic palette of sound . Every machine can do different things and even the oddest one (as the VO) can be really useful and amazing , when you use them with creativity. The thing to keep in mind with the Mono is that it’s not a standard synth, it’s a Monomomachine! Machines , usually, have only ONE oscillator, and this can be considered a great limitation, but it isn’t so. If you’re searching for bells, the EFM machines are the best, choose the parallel and play with the knobs, you ‘ll get a bell sound as soon as you turn those knobs. The filter section is composed by a really particular filter that act as a multimode. In use I can say that it can cut the low freq turning up the base freq(highpass), cut the high freq turning down the width (lowpass), or can be a band pass using the base to chose the”freq” and the width choosing the “band”. All in all is a very versatile filter that sound “elektron”, not a moog o roland replica/emulation, but it’s really rounded and acid, when you turn up the Qs, but it can even select the frequencies in a clinical way just to shape a minimal sound. The filter does not have an auto normalization/headroom, this can give it that carachter, if you want a clean resonance you ha to turn down the “volume” or “distortion”(headroom) in the AMP page. The AMP page is where we have the amp and volume settings and the particular AHDR env. 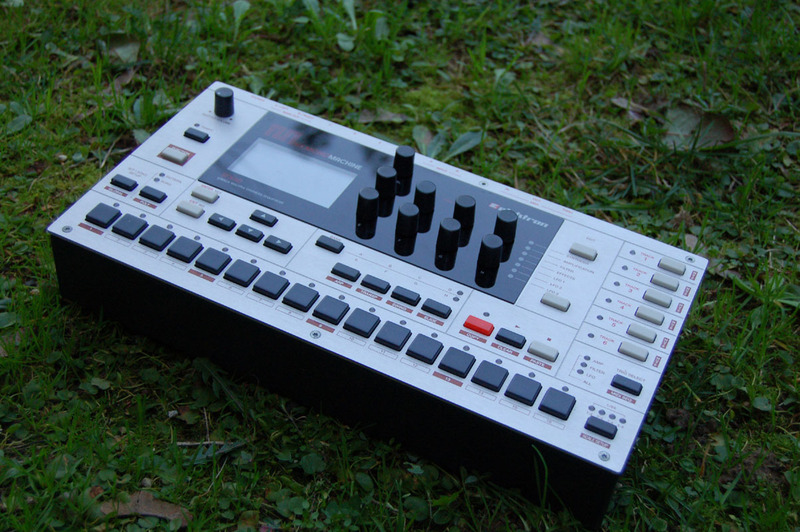 The reason this particular env was chosen by Elektron is because the Monomachine was born as a sequencer based machine so, the holod can take advantage of the sequencer way of thinking. Apart from HOLD the other things are quite standard, as volume, pan, portamento. The only parameter that really shape the armonics of the sound is the DISTORTION, that is the headroom. A higher distortion doesn’t “grunge” the sound or add noisy harmonics, but saturate the signal making higher harmonics less evident getting a darker sound. The EFX page is one of my favorite in the MonoMachine, they are not the classic delay /reverb, but Sample Rate Reduction, a parametric EQ and a delay. Last but not least the LFOs. Lfos are the key to the monomachine together with the parameter locks, because there are 3 of them and everyone can modulate every parameter of the synth generator. Imagine a modulated delay with a oscillating SRR… amazing! anatta embe on Acidlab Bassline – everybody needs the acid box! Copyright © 2019 synthvibrations.com. All Rights Reserved. Tonic created by c.bavota.